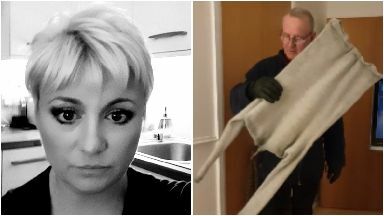 Dianne Melville accidentally froze her son's £90 jumper on the washing line last week. A mum froze her son's £90 jumper after accidentally leaving it outside in the cold last week. Dianne Melville, from Airdrie, recorded the moment the woolly garment was brought inside on video, before posting the footage on Facebook. 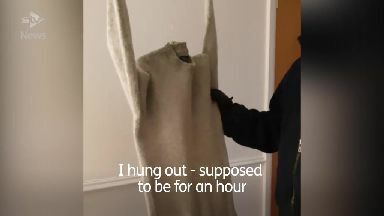 In the clip, which also features her husband John, Dianne says to their 18-year-old son: "David this is your Abercrombie and Fitch pure wool jumper that I hung out. "Supposed to be for an hour, to get a bit of air about it." "Sorry pal," she adds, giggling. Footage shows the jumper frozen in a hanging position with icicles attached to the neck and cuffs. Dianne shared the clip online with the caption: "This really has not been my day lol." Temperatures were as low as -8C in the area at the time.